Open since June 2015, Intuition offers meditation and spiritual classes, along with jewelry, gifts, crystals, and essential oils. Intuition is a place for people to find their inner peace, to be in tune with their creativity and celebrate their individual uniqueness, owner Dana Livoti said. Intuition’s two-year anniversary is approaching. The business first opened at 29 Main St. in Cold Spring Harbor in June 2015, and ever since has offered workshops and classes that range from meditation, astrology, intuitive development, psychic nights, channeling and gallery readings. 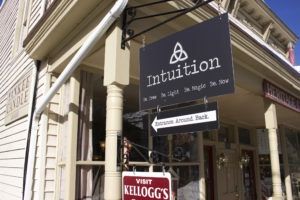 In addition, Intuition also sells jewelry, gifts, crystals, essential oils, karmic alchemy, and clothing and accessories at The Shop at Intuition. With this, the unique light warrior design bracelets are handcrafted by Livoti herself and can also be sold through Etsy. The shop is currently open Saturdays, 12 noon-5 p.m., but Livoti said customers can expect hours to be extended once spring arrives. Intuition also offers jewelry parties, which can be scheduled on case-by-case basis. For the past 19 years, Livoti has also been a first grade teacher at the Countrywood Primary Center in Huntington Station. She has written two children’s books, “There is Magic in Me” and “It Feels Good to be Me,” which seek to give children confidence and teach them to become empowered creators. Intuition also operates to promote local artists. During its open houses, which are held every three months, the space features a variety of work from talented local artists, Livoti said. In regards to her position, Livoti said that she enjoys making people feel good about who they are.